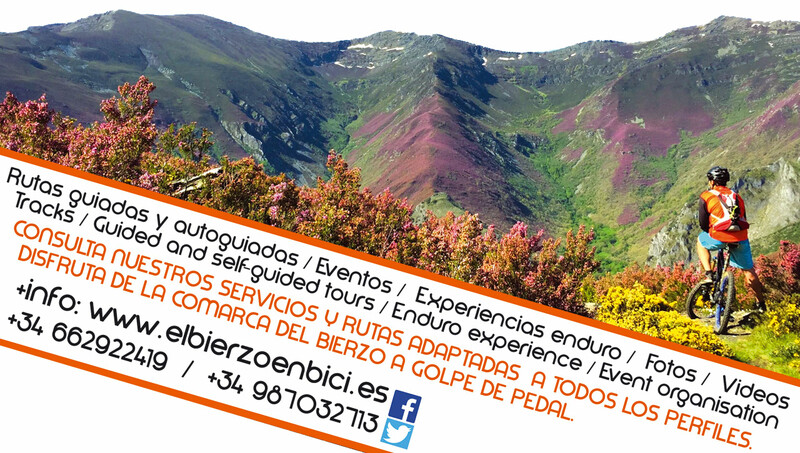 Enjoy the region of Bierzo a pedal stroke. Bring your bike and you will only have to ride and enjoy. Please see our services and routes adapted to all profiles. Discover our routes accompanied by a guide or self-guided with gps, maps and routemeter. You can travel from main routes of bercianas such as the camino de Santiago pilgrims 101 or the Mountemplaria, others exclusively designed by us under the commitment of ZERO ASPHALT. We can also accompany you on some stretches of the “look around” el Bierzo. From a quiet family outing to the more extreme enduro. Our guides are adapted at your own pace and can be the course of a few hours up to several days. Come and ride the Bierzo! Come and enjoy! Zero asphalt. This is how we see the mountain bike. We run away from the asphalt and love the paths. We avoid tracks and hair enjoying infinite forests bristling us. El Bierzo is a region located in the northeast of Leon ( Spain ), in the limit with Asturias and Galicia. Surrounded by mountains so the terrain is perfect for the practice of our passion: mountain and road biking. Visit our catalogue of services that will make you enjoy the bike and El Bierzo.